BANGI, 28 May 2014 – Muslims in the country have been cautioned to be wary of current Western thinking of clamouring for freedom without limits. 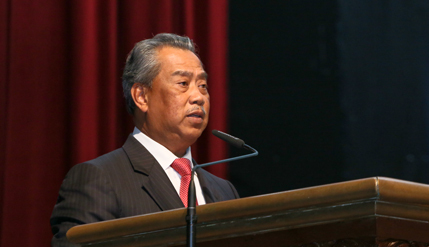 Deputy Prime Minister Tan Sri Muhyiddin Yassin said priority must be given to the Islamic faith in the practice of human rights. Closing the Congress on Islamic Non-Governmental Organizations (NGOs), at The National University of Malaysia (UKM) here today, Tan Sri Muhyiddin said some Western practices favoring unfettered secularism and liberalism are clearly contrary to Islam. “Similarly, the rights of marriage for couples of different religions and lesbians, gays, bisexuals and transgenders,” he said when addressing some 2,000 delegates from 198 NGOS at the congress organised by Islamic Da’wah Foundation Malaysia (YADIM). He said the practice contradicted the fundamental principles of the Islamic faith that calls on Muslims to keep their faith and devotion to God Almighty. “These practices are clearly in conflict with the laws and not recognised as a right that should be preserved in Islam,” while urging them to refer to the 1990 Cairo Declaration of Human Rights in Islam as a guideline to promote human rights within the Islamic context. “The content of the Cairo Declaration can be used as a guideline for Muslim countries to promote an understanding of human rights according to Islamic perspective,” he said. The Deputy Prime Minister later received the congress’ resolutions from the of Vice Chairman of the Assembly of Islamic Scholars (HAKIM) Wan Ahmad Wan Ahmad Kamal Fayhsal. The resolutions, among others, urged the government to use its powers enshrined in the Constitution to defend the integrity of faith and exhort Muslims in the country to unite irrespective of political affiliations. Islamic NGOs, including YADIM and HAKIM have a very important role in explaining to the public about the concept of human rights in Islam, Muhyiddin said. Also present at the ceremony were the UKM Deputy Vice-Chancellor (Research and Innovation ) Prof Dato’ Dr Mazlin Mokhtar; YADIM President Senator Datuk Dr Asyraf Wajdi Dusuki; Chairman of the Economic Council of Selangor, Datuk Seri Noh Omar and Director General of the Department of Islamic Development Malaysia (Jakim), Datuk Othman Mustapha.